By Shauna Irwin | October 15, 2013. Meath Street sits at the heart of local tradition for all Liberties residents, whether they’re born, raised or simply situated here, writes Shauna Irwin. Along a winding road between Thomas Street and the Coombe, a glimmer of old Dublin sparkles. All past traits of the wonderful city reside here in the form of the old Liberties Market, the stalls and shops which line its brim. Many third level students from the National College of Art and Design (NCAD) witness this sight every day, with only a couple of dozen feet separating them from this inspiration for one of their latest projects. Another element that inspired these students was the Dublin project – initiated by Dublin City Council and Dublin in 2012 – which worked to create a heritage trail between Trinity College and Kilmainham. 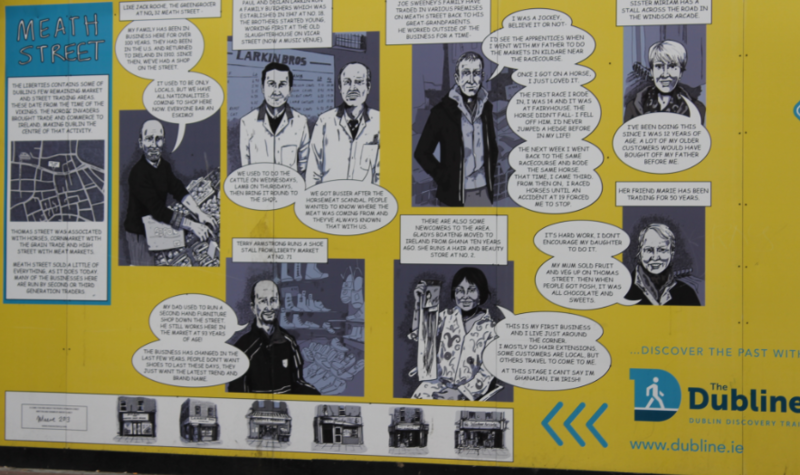 Wielding a passion for the arts and the project’s incentive to create something for the visitors and locals of Meath Street, these third level students created a mural for the business owners that have worked there for years. This mural became one of many exhibitions NCAD students completed as part of their ‘See the Future’ brand, which consisted of fashion shows and a range of art exhibitions. Occupants of many enterprises in Meath Street, new and old, tell their stories through the artistic display, which shows their animated image and explains their line of work through the use of speech bubbles. Paul and Declan Larkin run a family butchers which was established in 1947 at no. 18. The brothers started young, working first at the old slaughterhouse on Vicar Street. “We used to do the cattle on Wednesdays, lamb on Thursdays, then bring it round to the shop. We got busier after the horse meat scandal. People wanted to know where their meat was coming from. They’ve always known that with us,” they said. The mural shows that some people grew into their businesses throughout the generations, while others have come and gone over the years. But what the mural really represents is the possibility for tradition to blend with new and exciting ventures by new people, and the diversity of the Liberties area. Gladys Boeteng moved to Ireland from Ghana 10 years ago. She runs a hair and beauty store at no.22.